An August 18th 1940 Kenley raid story. In 1940 my mother was living with her parents in Oak Road, Caterham. I can’t recall the exact number of their house but it stood on the right hand side, about half way down before the bend (the number 20 or so seems about right). August 18th 1940 was a Sunday and, as we know, the raid on Kenley took place about 1 o’clock. Like most other families, Sunday lunch was being prepared when the sirens went off giving warning of the approaching Dorniers of KG 76. My mum and Grandmother dutifully went down the garden to their Anderson shelter, imploring my Grandfather to do the same. Grandad however was made of sterner stuff and with words something like ‘That bloody man Hitler’s not going to stop me having my Sunday roast!’, he continued working away in the kitchen. The sound of approaching aircraft and even bombs starting to go off couldn’t deter him from his vital task. In the midst of all the mayhem just up the road at the aerodrome my mother recalled peering up the garden to the house. She saw Grandad appear from the kitchen door and start walking nonchalantly down the path to the compost heap, a colander full of spud peelings in hand, fully determined to show ‘those damned Jerries’ some British stiff upper lip. But before he had taken many steps, a Dornier 17 shot over the house at roof top height, causing Grandad to finally lose his composure. The colander, peelings and all flew in the air never to be seen again as Grandad made a rather undignified headlong dive into the Anderson, where the three of them plus the family Jack Russell then huddled in fear for their lives. The sky seemed to be full of aircraft roaring overhead (my mother only recalls German bombers; no intercepting fighters were to be seen from their viewing point) and the earth regularly shook with detonations. Eventually there was a tremendous explosion very nearby and everything in the Anderson, including themselves and the dog, jumped into the air. 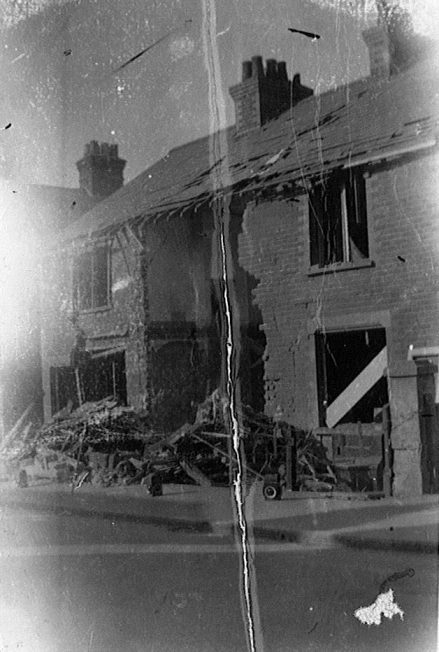 After what seemed an eternity the ‘All Clear’ sounded, and when they emerged into the daylight they saw that the middle house in their terrace of three had taken a direct hit, destroying their own end house in the process. The lady who lived in the middle property had taken shelter under the stairs with her only child and tragically they were both killed. My Grandparents and mother lost virtually their entire belongings, only having the clothes they stood up in left (plus a rather traumatized Jack Russell). This jug was a survivor of a bombed house during the raid on the 18th of August 1940. 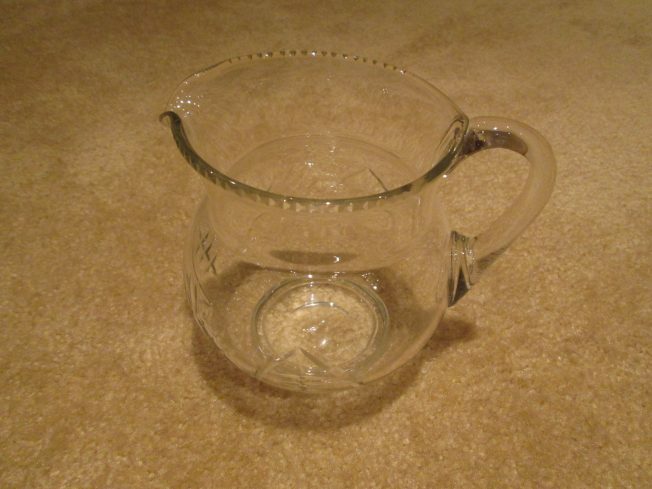 By one of those strange quirks of fate, while their china and glass cabinet and its entire contents in the front ‘best parlour’ was smashed into tiny pieces, the little glass milk jug in the photo sat proudly in the middle of all the destruction with not a scratch to be seen. Mum and my Grandparents spent the rest of the day huddled in an anti-aircraft gun pit on the corner of Town End Rec until they could be found a place to sleep. (Incidentally, the poor Jack Russell had quite an eventful war. French Canadian troops were later billeted in and around the Caterham area and when they shipped out prior to D-Day the dog mysteriously disappeared at the same time. Whether or not he shipped out voluntarily or was just acting under orders was never discovered). After the war my family moved in to 11 Oak Road which is almost opposite the site of their former home. 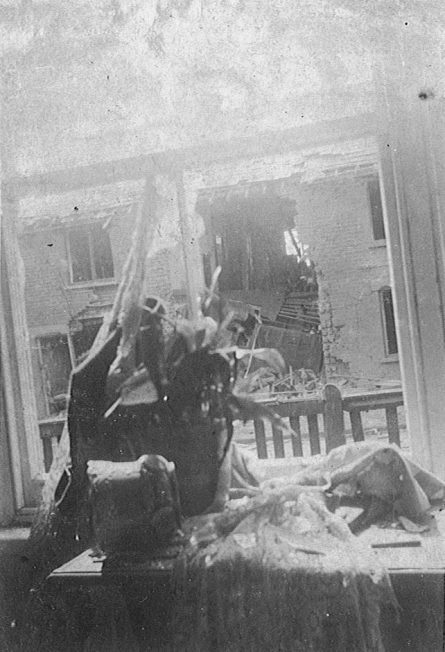 To this day the scars from bomb splinters can still be seen in the brickwork and window sills of No.11 and the lone survivor milk jug is a treasured relic of the August 18th Kenley raid.